Moudi Sbeity (left) and Derek Kitchen (right) in front of their restaurant, Laziz Kitchen, in Salt Lake City. 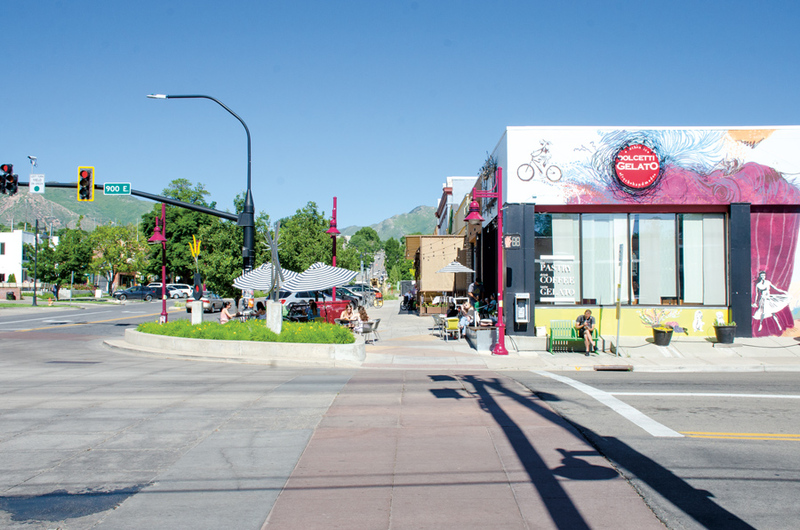 If you’ve read Issue 6, you may recognize Moudi Sbeity and Derek Kitchen as our Salt Lake City guides. Last summer, they took us through their hometown during its thriving Pride weekend, for a memorable few days of food and gay festivities. As both restauranteurs (they own the modern Middle Eastern eatery Laziz Kitchen) and LGBTQ community leaders (Derek was recently elected as a state senator, and in the 2013 case Kitchen v. Herbert, they were one of three couples who successfully challenged the state’s ban on gay marriage), they’re uniquely poised to speak to the city’s vibrant queer scene, as well as its vibrant food scene. In a little over a week, we are beyond excited to return to Salt Lake for the first-ever Queer Food Festival. This will be a one-of-a-kind event, first with a party on Saturday night showcasing a sampling of bites by queer chefs and food businesses from across the Salt Lake City area, as well as signature cocktails, drag performances, and dancing, with all proceeds supporting the life-saving services of the Utah Pride Center. 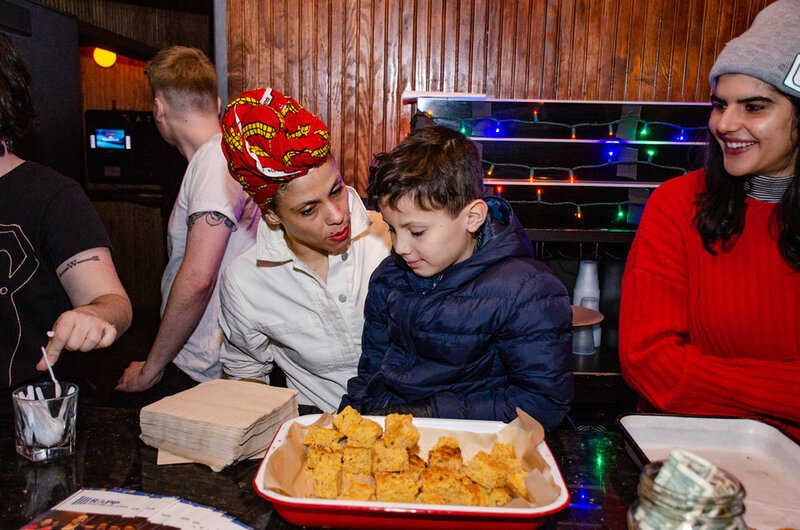 Then on Sunday, Laziz Kitchen will host its first-ever Drag Brunch, featuring 5 local queens, mimosas and other daytime cocktails, and a brunch spread prepared by Moudi and his team. 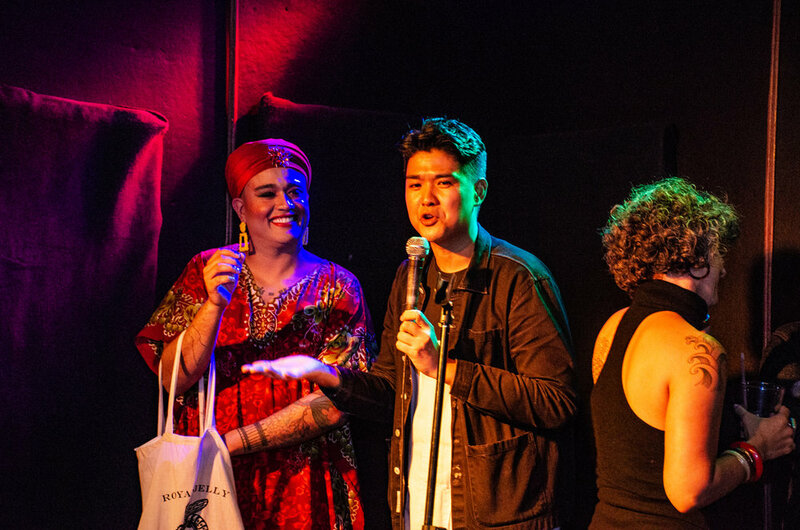 We spoke with Moudi and Derek about some of the new developments in their lives since last summer when we saw them, as well as about what to expect at the Queer Food Festival. Get your tickets now for the QFF party and Drag Brunch! Since we saw you last year, Derek was elected Senator for Utah Senate District 2! Derek, how are you enjoying this new role? And Laziz Kitchen was featured on the Guy Fieri show Diners, Drive-ins, and Dives—what was that experience like? Did it affect business at the restaurant? [Derek:] I love it. I am learning so much and building really important relationships in the community. Being a Senator definitely comes with its fair share of challenges, though. I represent a large and diverse district, so balancing the differing views of my constituents can be hard. Overall I enjoy the built-in pressure and diving into policy. [Moudi:] And being featured on Diners, Drive-Ins, and Dives was an incredible experience beyond anything we could have ever imagined for our “Pop & Pop” (Guy Fieri's words) restaurant. Business ticked up since, and we're excited to see what comes next! 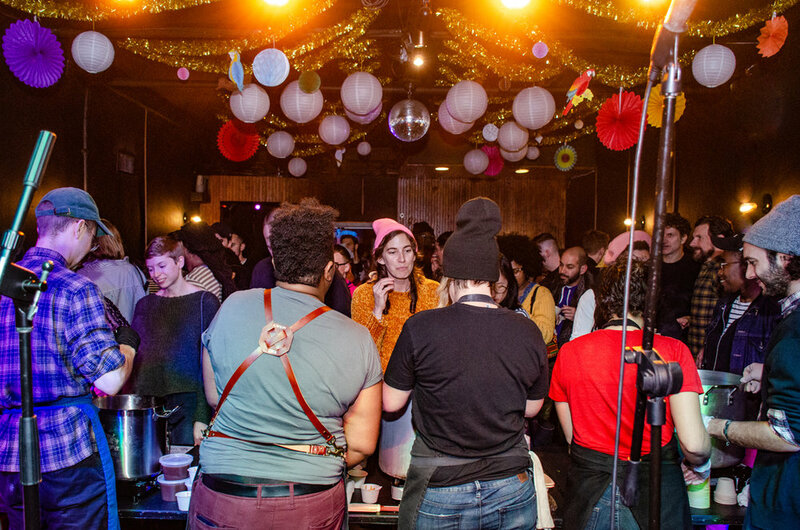 As we wrote in our Issue 6 story about you two, Salt Lake City is both a vibrant queer city and a vibrant food city—making it a perfect spot for the first-ever Queer Food Festival. Do you have any insight as to how SLC evolved this way? Salt Lake City, for as long as I can remember, which is only 10 years, has always been queer. I think I read somewhere that it is fifth on the list for most gayest cities in America, and first for gay parents per capita. Besides LGBT people in Salt Lake, the heavy-handed influence of the Mormon culture gave life to a very strong and vibrant counter culture, which most definitely included the queer community. 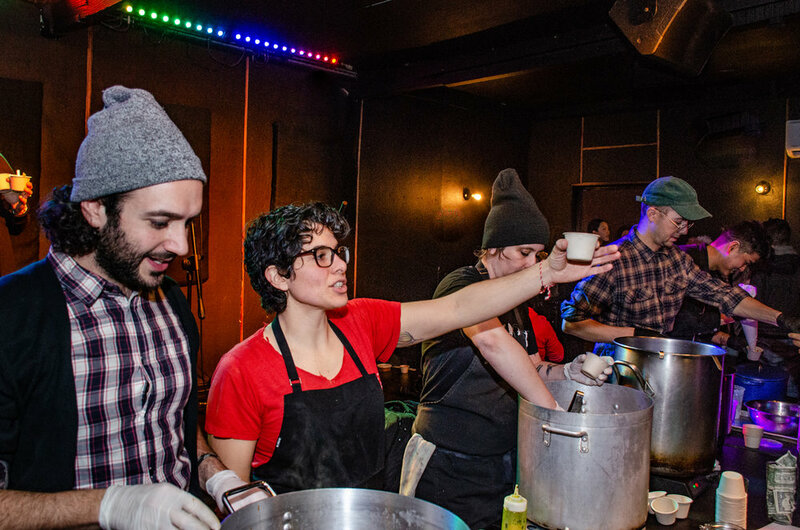 The Queer Food Festival will be the first of its kind in Salt Lake, and that is a testament to our growing city. in 2016, Salt Lake City voted to name a twenty-block stretch of 900 S Street Harvey Milk Boulevard. 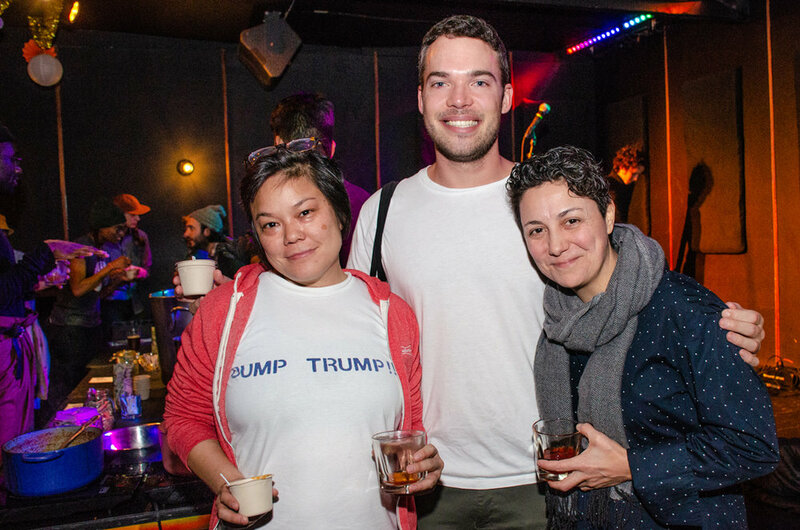 It’s a hub for the city’s gay-owned businesses. Tell us a bit about some of the people and food businesses participating in the QFF. How did you go about pulling together this group of food folks? It was not hard at all to pull together a group of establishments, and there still are many that we haven't talked to yet! Which is a good excuse to grow this again next year. Some of the featured establishments are Pallet and Meditrina, both lesbian owned fine-dining restaurants in the city. We'll also be joined by the Coffee Garden and Nostalgia, both gay owned coffee shops with pastries and savory bites. 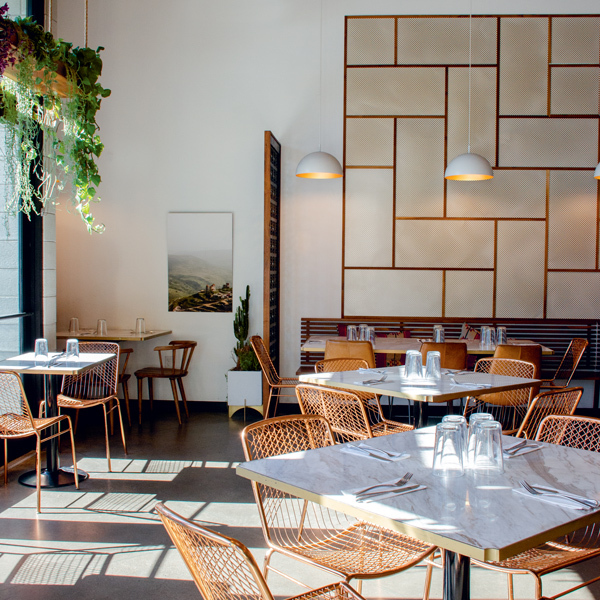 Others include Fillings and Emulsions (a pastry shop), Stone Ground Kitchen, Laziz of course, and allies like Caputos, The Rose Establishment, and Beehive Cheese. 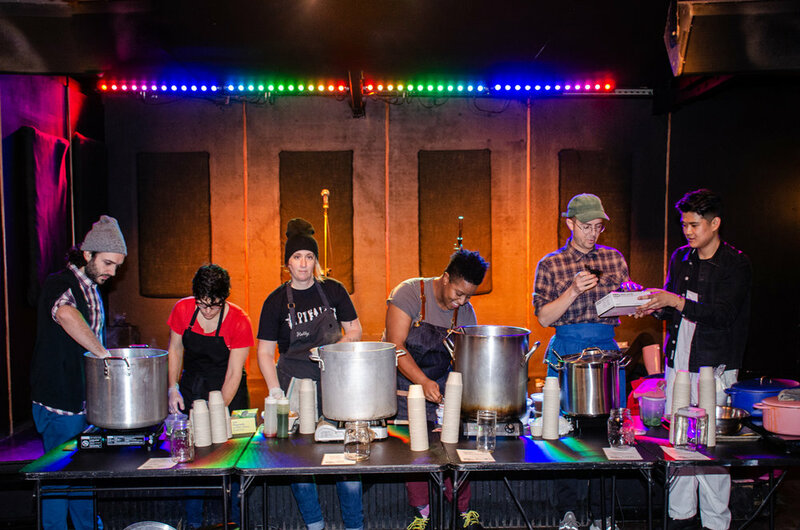 When the opportunity to throw a queer food party as a fundraiser came up, I immediately thought of the Utah Pride Center. The UPC is a local LGBTQ organization that supports queer youth, hosts the SAGE group for the aging LGBTQ population, and organizes the official pride parade and festival. I've always admired their contribution to the queer community in need, and I see the potential that can happen for a lot of the youth that need their support. Additionally, the UPC has the resources, connections, and talent to organize an event at this scale, which is a huge help. 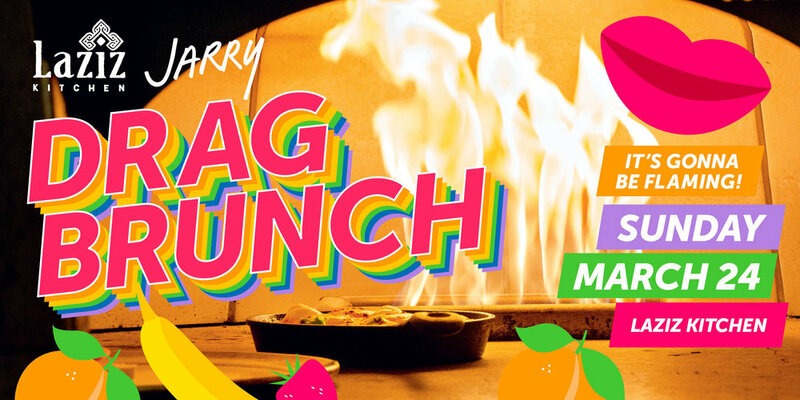 And the weekend will also feature Laziz's first Drag Brunch, right? Had you considered hosting one before? YAAAAAS! This will be Laziz's first drag brunch! I had always dreamed of hosting one but never knew how to go about it. It's finally happening, and I'm so excited to bring more life into our restaurant. Who doesn't love a confident queen to tickle your senses while you sip on mimosas and jiggle your over-easy eggs? What can people expect next weekend? What do you hope we all accomplish with the QFF? 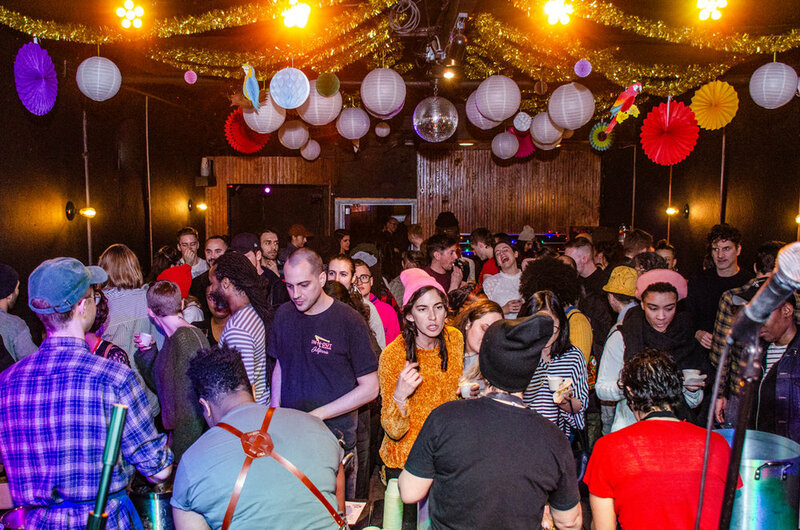 Food, drinks, and all the queer your heart could desire! 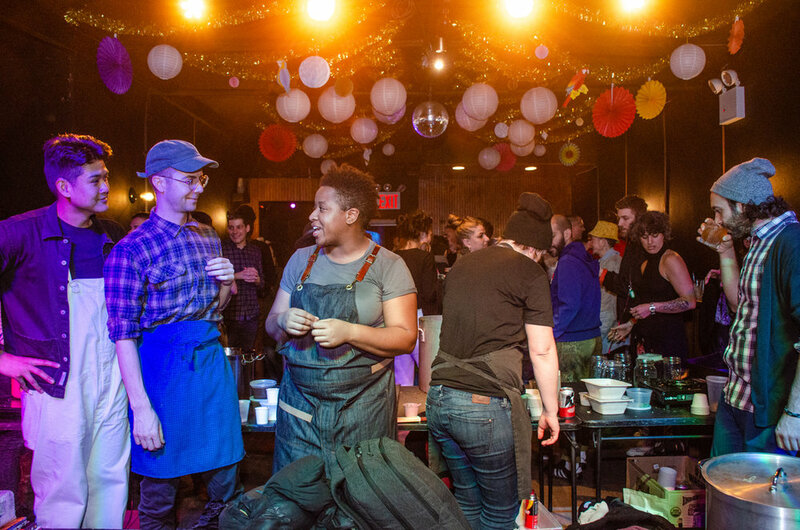 I'm hoping this will be a night for industry workers to come together for elevated cuisine, boozy drinks, and expressive queers that deserve a night to celebrate. This isn't your typical fine-dining food-tasting event. This is a party, catered by the best of the best in Salt Lake City. If you're not feeling yourself by the end of the night, you probably didn't let loose enough <3. 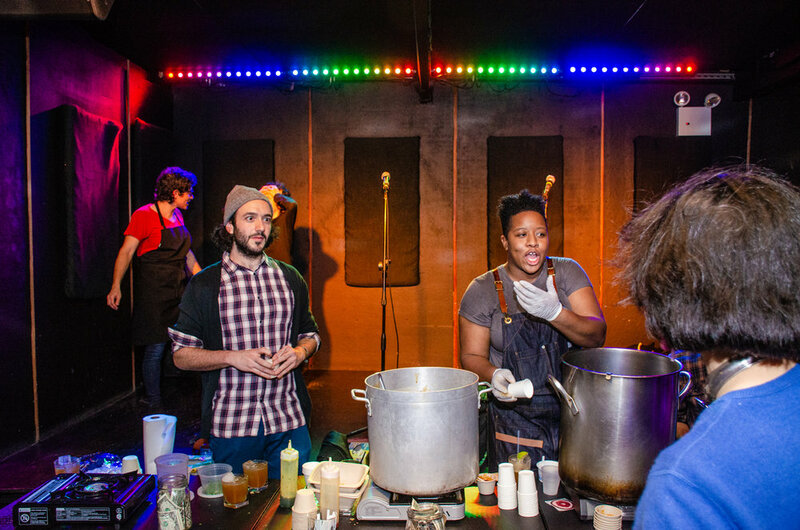 The Big Queer Chili Cookoff! 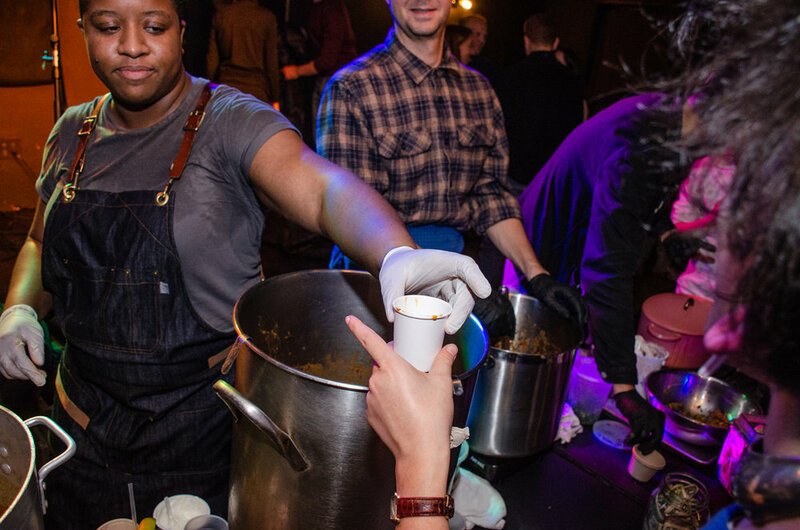 The first-ever Big Queer Chili Cookoff was LIT. Thank you to everyone who joined us and made donations to the RAPP Campaign, which fights to get aging people released from prison. Together we raised $1300! 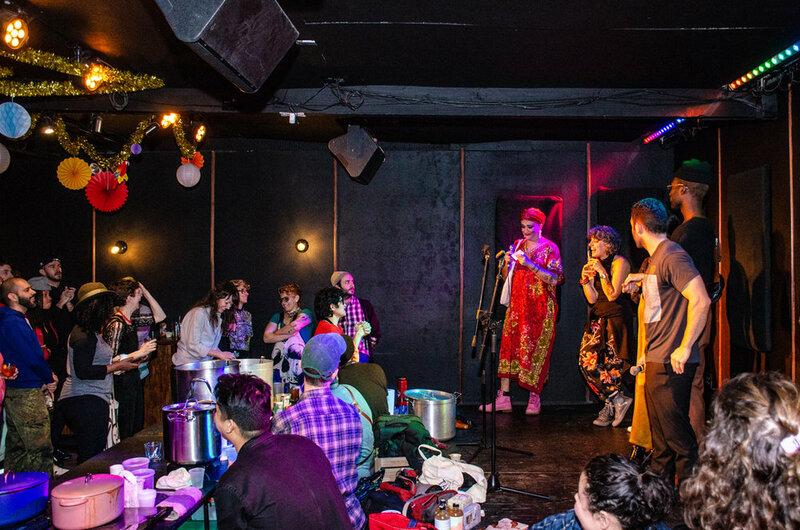 Huge thanks to event partners Queer Soup Night and Food Book Fair for making it such a success, and to our esteemed judges and chefs, our glamorous hostess Shaquanda, and C’mon Everybody for inviting us in! Competing chefs Holly Sheppard of Po'Mi, MJ Sanders of Brownsville Community Culinary, Woldy Reyes of Woldy Kusina, Liz Alpern of Queer Soup Night, and Lukas Volger of Jarry each presented their own of pots of chili for the judges and crowd, who voted for their favorites by dropping cash donations for the RAPP Campaign into their favorite chefs’ jars. Delicious cornbread was served on the side by bakers Gabriella Vigoreaux of Smith Canteen and Lani Halliday of Brutus Bakeshop, with special cocktails by Shannon Mustipher and Al Culliton. 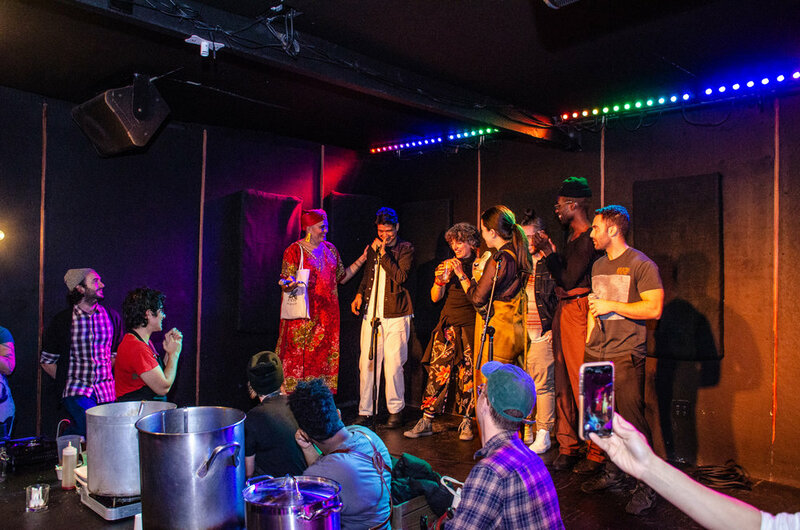 Our host for the evening, Shaquanda of Shaquanda’s Hot Pepper Sauce, provided expert commentary and guest judges Ora Wise, Andy Baraghini, T. Wise, DeVonn Francis, and Kimberly Chow Tsun An navigated a very close and tough competition to deliver the top prize to Woldy Reyes. Congrats Woldy! 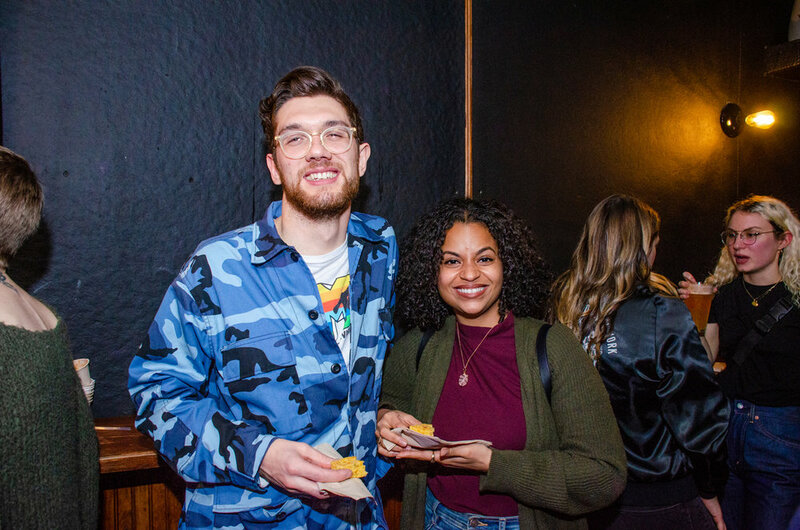 View the gallery of photos below, and be sure to join us at our next event! Subscribe to Jarry Briefs to receive the latest news, updates and invitations, direct to your inbox. Order your copy of Issue 6: Mind & Body now! 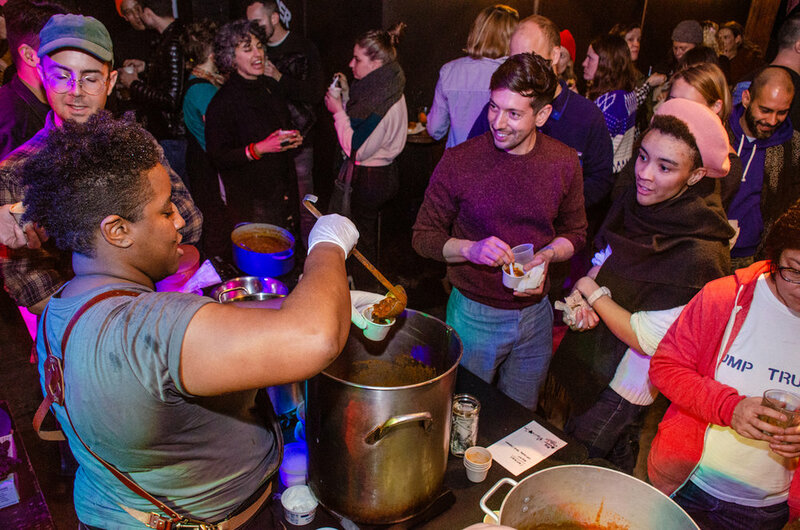 Join us for the Food Book Fair and the Big Queer Chili Cookoff! We’re thrilled to take part in the Food Book Fair again—a celebration of indie food publishing, alongside our favorite food mags! Come find our booth at the Atlantic Center on Saturday, March 2nd, and Sunday, March 3rd! We’ll be selling the current issue and offering a 25% discount on available back issues, while supplies last. 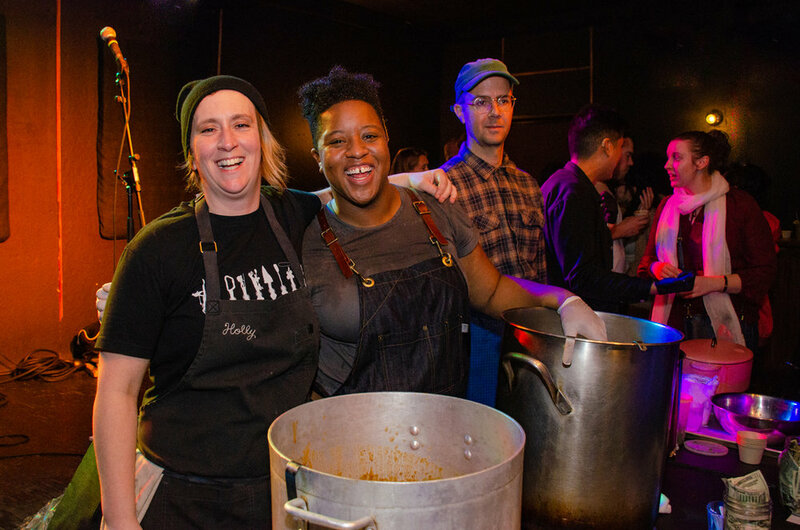 Then join us Sunday night at C’mon Everybody for the Big Queer Chili Cookoff with Queer Soup Night and some of our favorite JarryType chefs, all benefitting the RAPP Campaign. Continue reading for details! 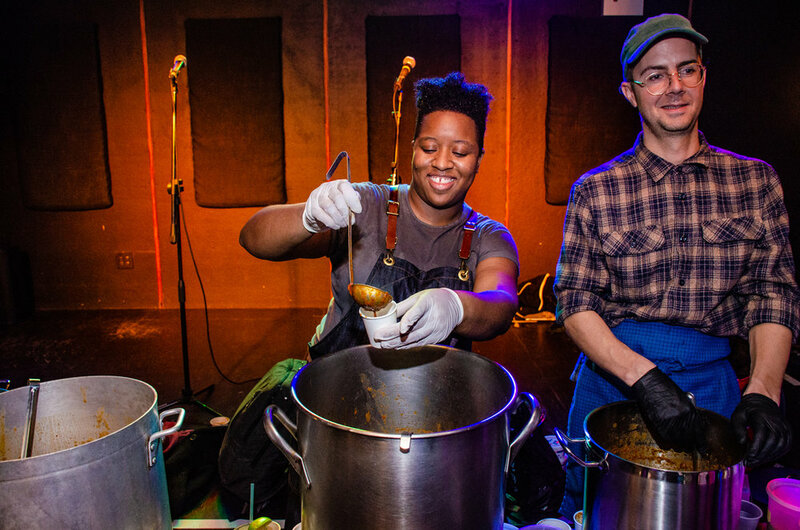 A round-up of Queer Soup Night all-star chefs—including Holly Sheppard of Po'Mi, MJ Sanders of Brownsville Community Culinary, Woldy Reyes of Woldy Kusina, Liz Alpern of Queer Soup Night, Lukas Volger of Jarry—will present their own of pots of chili, with both meat and vegetarian versions available. There’ll be cornbread on the side, by bakers Gabriella Vigoreaux of Smith Canteen and Lani Halliday of Brutus Bakeshop, and as well as special cocktails by Shannon Mustipher and Al Culliton. Additional drinks will be available for purchase at the bar. 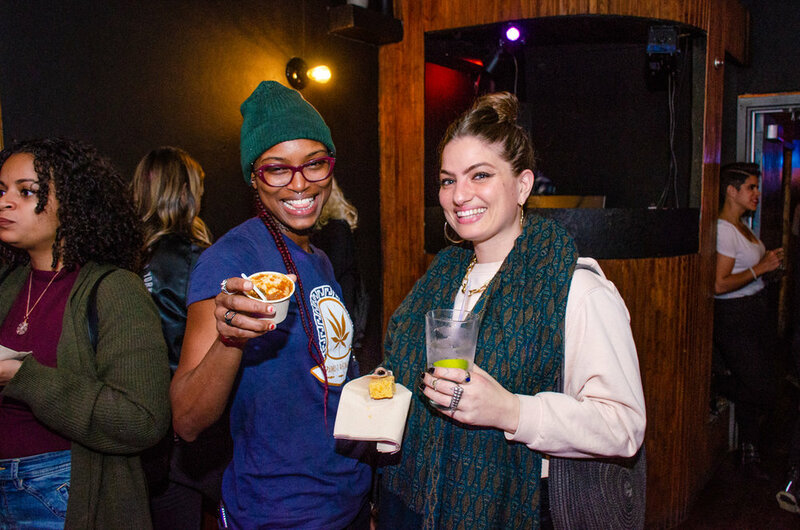 And we’ll have expert commentary from host Shaquanda of Shaquanda’s Hot Pepper Sauce and guest judges Ora Wise, Andy Baraghini, T. Wise, DeVonn Francis, and Kimberly Chow Tsun An. 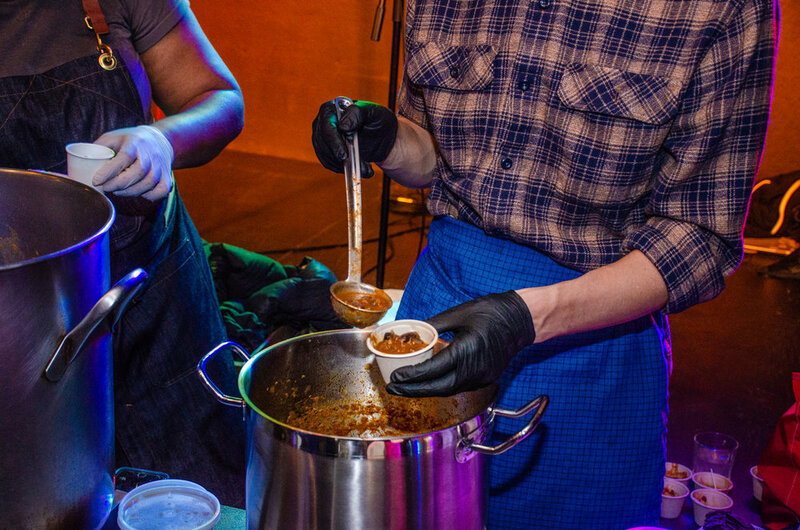 Attendees will get to taste all the chili and then vote on their favorites with donation dollars, with all funds raised benefitting the RAPP Campaign, which works to release aging people from prison. Photos and Art: Banner art by Steve Viksjo, Food Book Fair art courtesy Food Book Fair, Queer Chili Cookoff art courtesy Queer Soup Night. Order your copy of Issue 6: Mind & Body! 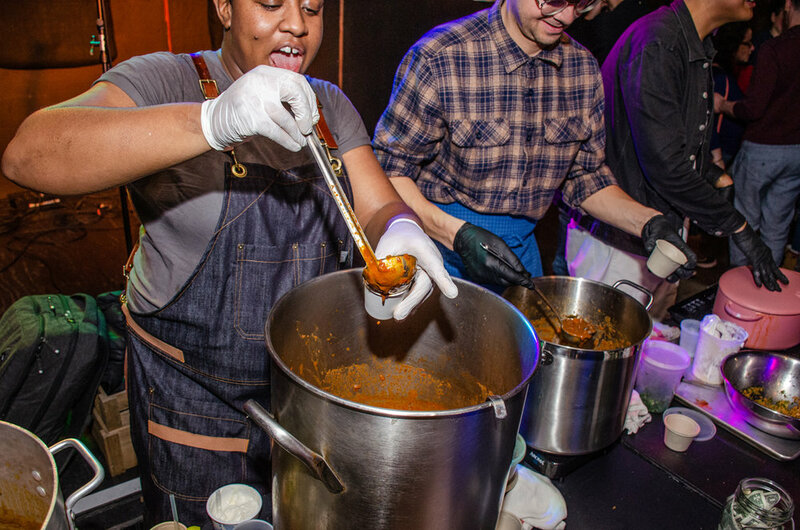 Bitten is a conference series that examines food from surprising angles: Scientists and historians share the stage with entrepreneurs, activists, artists, and chefs, collectively illustrating how some of the most compelling food stories are often about more than just cooking. Now in it’s fourth year, we spoke with Bitten founder Naz Riahi about the scope of Bitten and how it’s changed since it began, and what’ll be happening at the upcoming conference on November 1st in New York City. How is Bitten different from other food conferences? 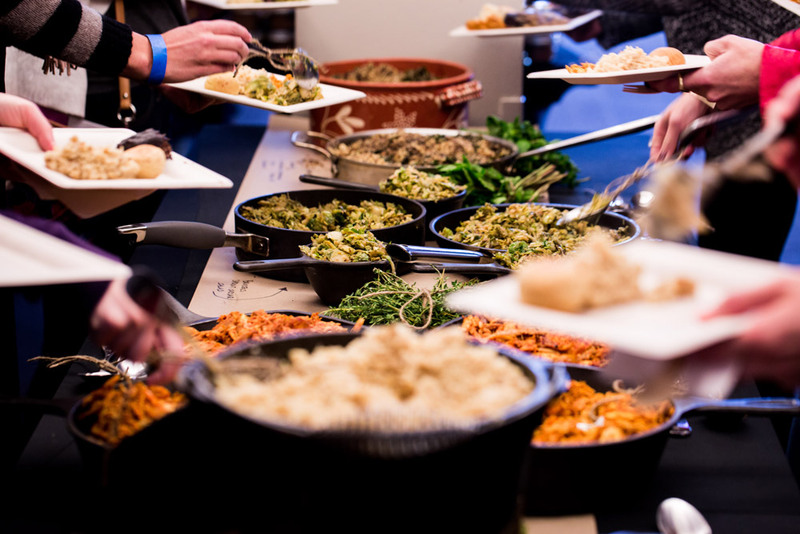 It's designed to be a day of ideas and inspiration and to be completely inclusive to everyone—meaning our audience doesn't have to work in food to attend. 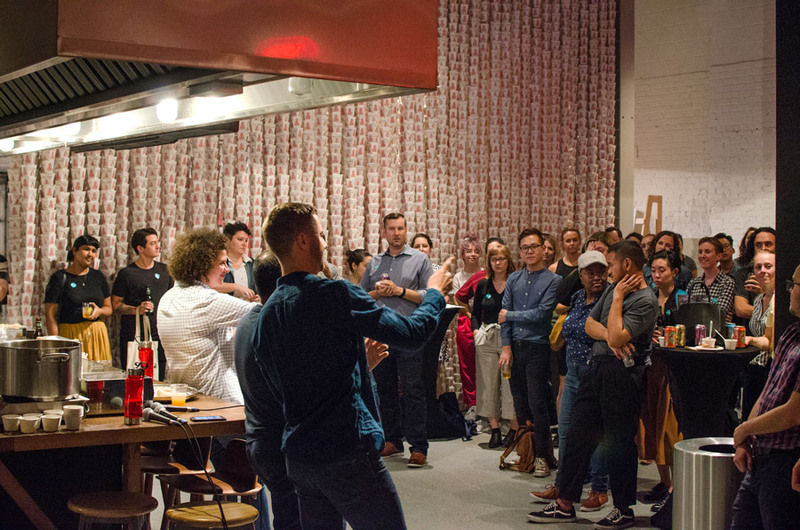 In fact we encourage those who don't work in food to take a day off and attend Bitten because it's only when we step outside of our everyday world that new ideas are ignited and new connections are made. It's also different because the primary focus is on the speakers and their talks. Every single audience member sees the same ones—there aren't activities or tracts to distract and water down the experience. And, we work with all of our speakers and help them nail down and fine tune their talk—and that shows! Your speakers come from so many different disciplines—art, history, science, media... Very few are chefs. How do you go about curating the program every year? Bitten is grounded in food, but from there it goes in all sorts of different directions. This year we're covering art, psychedelics, Anthony Bourdain, the restaurant world, spirituality, justice, community, Gen Z, power, and so much more. In addition, our youngest speaker is 21 and our oldest is in her 60s, with others covering every decade in between! It's pretty amazing. As far as curating, I start with food and then think about extraordinary and unexpected stories. I want our speakers to blow the audience away and get them to think differently or see something form a new perspective. I spend the year having a lot of coffees with new people, reading a lot, and asking my former speakers what and who has stuck out to them, and I take it from there. How have you seen these the scope and tone of the talks evolve in the time since Bitten began in 2015? The vision for Bitten has become more clear. I focus a lot more on designing an inspirational event today than I did in 2015. In addition, I think about the people who take my stage. That first year, I reached out to a lot of amazing people and without realizing it, I had an almost all caucasian speaker set. 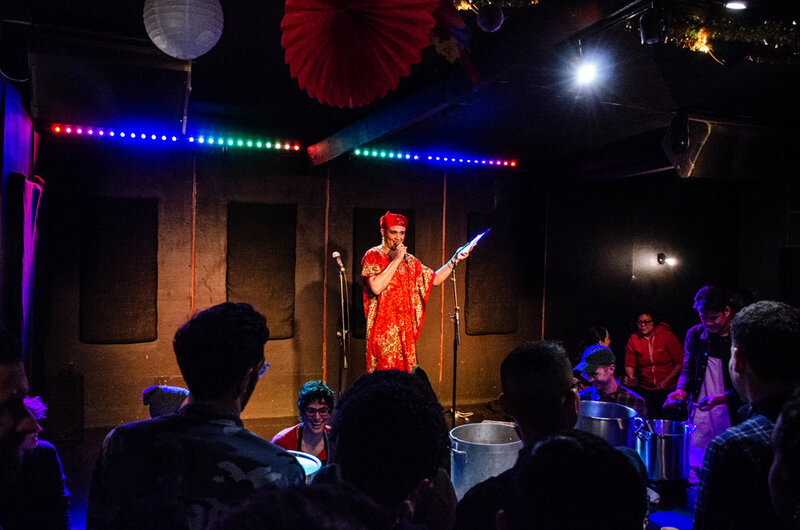 After that, I realized I had a microphone and a stage to share, and it’s my responsibility to make that stage as inclusive as possible, to bring forth marginalized voices and stories. On a more tactical level, I also have begun working with every single speaker on their talk. In the first few years, I would find a topic or a speaker, meet with them and generally discuss their talk and then hear it for the first time at Bitten. Now, I work with them in advance, going over drafts of their presentation and talk, offering feedback, helping them fine tune or bring a story forth that they didn't think they had in them. Editorial Director Lukas Volger presenting at Bitten in 2016. Photo credit: Bitten. It was such an honor to speak at your 2016 conference—it was right after we launched our first issue. Can you highlight any current or past talks that delve into LGBTQ identity? That said, we have had some extraordinary talks dealing with the LGBTQ community. One was yours, of course. Another was a talk Andy Baraghani of Bon Appétit gave last year. I knew I wanted Andy to speak for a lot of reasons and I vaguely had the sense that I'd ask him to speak about how Iranian food has become so trendy. When we got on the phone and I started to ask him about his experience cooking Iranian food, he told me that it was kind of new to him, because he had hid his ethnic identity for many years. It also came out that he had hid his sexual identity—ashamed of being gay and Iranian. I knew then that this was the talk Andy had to give. It took a little convicting and a few weeks of practice calls, but when he delivered his talk the audience was in tears. He honored my request to be vulnerable and the result was unique, touching, and unexpected. He was able to turn that talk into an essay for Bon Appétit that went viral last year. And this year we have Liz Alpern giving a talk called “On Food as a Weapon of Power.” When I first approached Liz to give this talk, she was intrigued but wanted to find a way to make it her own. The solution was to position the talk within the context of the current food-meets-justice movement within the LGBTQ community. Would you give us a taste of what you're looking forward to at this year's conference? Literally every single talk! I know that sounds impossible, but they're all so great. The full agenda is here. This year we have talks on psychedelics, we'll hear from a Gen Z farmer and then we'll learn from a researcher about who Gen Z is and their influence on trends in the food space. Laurie Woolever has kindly accepted our invitation to talk about her friend, boss and mentor Anthony Bourdain in a talk called “On Tony, Or How Everybody Wants a Hero.” My friend Nasim Alikhani will talk about the magic of opening her first restaurant to rave reviews. 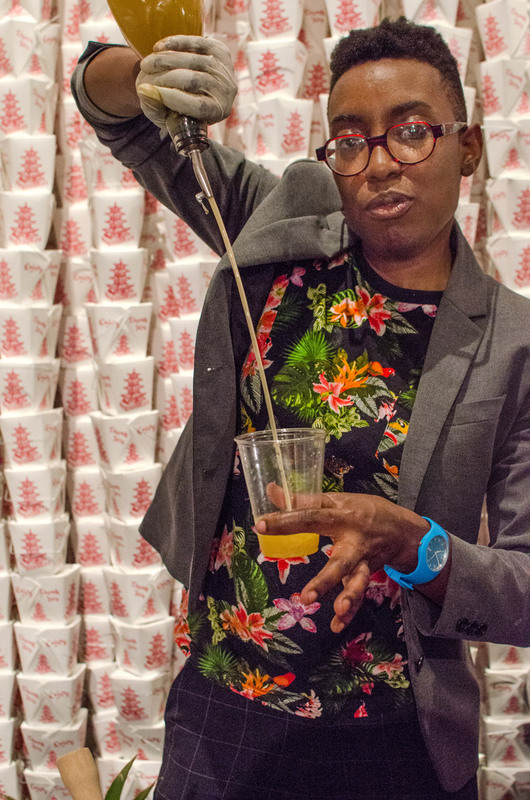 Tunde Wey will discuss his work at the intersection of art, justice, and food... I could literally list every single speaker and talk here, but I'll just say, I hope the Jarry community attends. They'll go back to work feeling like they were part of something truly special. For more information, and to buy tickets for the Bitten conference on November 1, 2018, in New York City, click here. Last week at The Museum of Food and Drink, we joined authors Julia Turshen and Nik Sharma in celebrating their new cookbooks Now & Again and Season for a “Soup & Sip with Julia & Nik.” The event was put on in collaboration with Chronicle Books, Queer Soup Night (with soups prepared by Jesse Szewczyk), and Shannon Mustipher, and additionally we raised funds to support the Stonewall Foundation’s Levin-Goffe Scholarship, which supports undocumented LGBTQ immigrants. 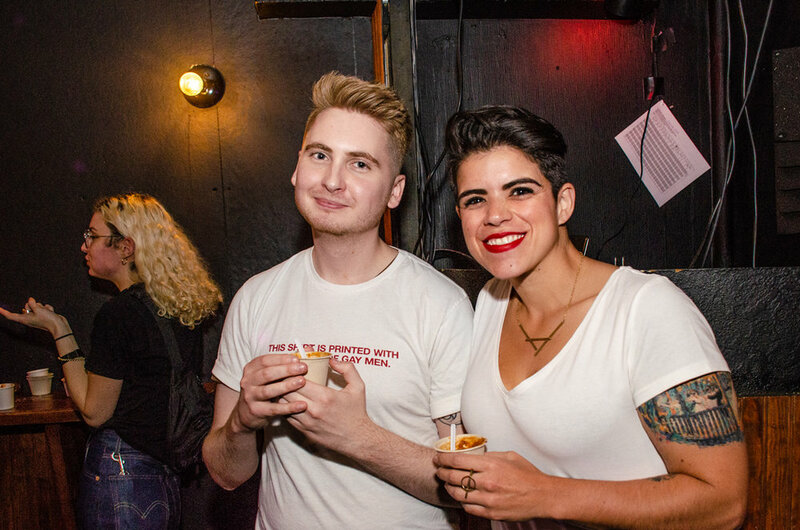 We spoke with Julia and Nik about how the LGBTQ community has become part of their work, their experience writing cookbooks as people with marginalized identities, and how cookbooks can be vessels for much more than just recipes. Here’s an edited transcript of our conversation. 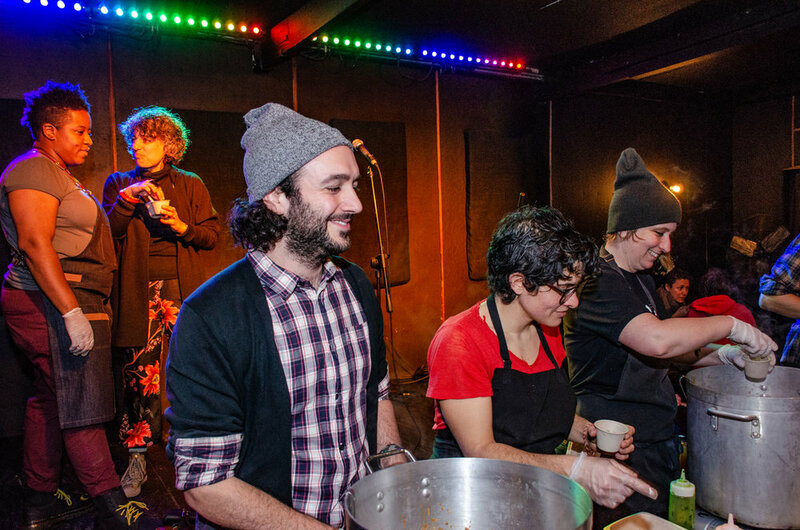 Liz Alpern (right) of Queer Soup Night, with soups (Julia’s Tortilla Soup with the Works and Nik’s Cocoa-Spiced Bean and Lentil Soup) prepared by Jesse Szewczyk (middle) and Kyle Bartone. Cocktails by Shannon Mustipher, from her upcoming book, Tiki. Nik Sharma’s Roast Leg of Lamb from Season, prepared by MOFAD chef John Hutt and his team. When did you first become aware that you were part of a community, and when did it become part of your work? Nik Sharma: When I wrote my first book there were so many times when I went through insecurities, questioning myself. Julia was there for me, my husband was there for me, my friends were there for me—I could text my friend Ben at night and say, “Hey, I’m going through a crazy moment right now.” That’s what I really love about the queer community, that there are authors out there—successful people—who are willing to share their struggles with you and support you to go ahead. And that’s something that I hope I get to do in the future, with younger writers and people coming into the food scene. And when I found out, for example, that there are a bunch of writers that are from India, like Tejal Rao from the New York Times and Mayukh Sen, these vibrant voices who are so successful and doing well—and Mayukh is also gay—you feel a part of that success, in a way. And then there are people like Julia who, on the other hand, help create a tribe that supports you. Julia Turshen: I’ve always been involved in community where ever I’ve lived, from a pretty young age. When I got married I feel like it became more important than ever—by then, I’d gotten to know myself better, and my identity and community and the intersection of those things really shifted. 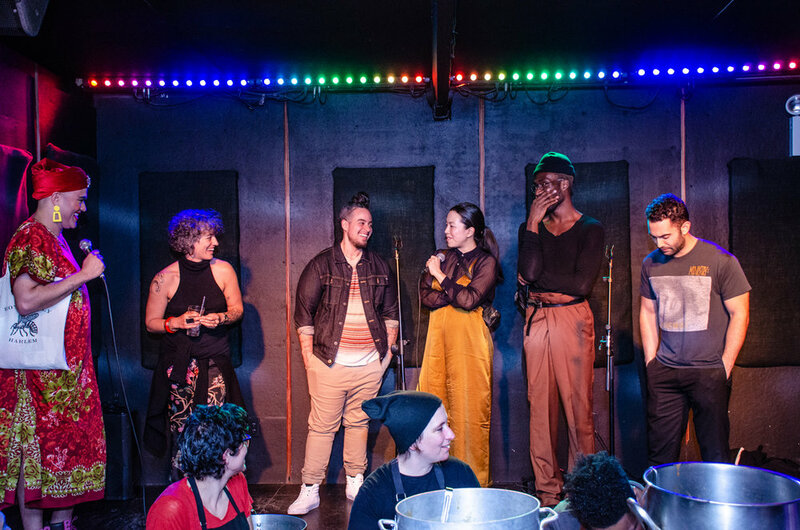 There’s a lot that makes the queer community so special, and one of those things is the notion of “chosen family.” That’s something a lot of us can probably identify with and share—the texting friends at night, talking to each other, that kind of thing. I don’t have that with straight writer friends. Maybe a little, but it’s different. We all want to lift each other up. Seeing you [Nik] shine makes me so happy. I think there’s something so beautiful about a community where it’s not about competition—competition comes from scarcity mentality, that “oh there’s only room for one.” And for us, if you’ve ever been othered in some way, I think we all just want to be together. That’s really special, and so intrinsic to food: Make a bigger pot of soup! Everyone is welcome. Oftentimes the intended scope of a cookbook focuses on the nuclear family. Is that something you’re thinking about, or working around, when you’re writing your cookbooks? Julia: On a technical level, so many recipes “Serve 4,” and there’s this idea of a mom, dad, two kids, and a fence. It’s something that I played around with in Now & Again—there are recipes that serve 8, there are recipes that serve 2. And building the book around menus, a lot of them tell stories through the book. Like, “this is something in my world that serves a larger group.” I think family is a beautiful concept but it can be a really tricky one, especially tricky in our community. Family is something we can all choose to define however we want. Nik and I both have a lot of animals in our nuclear families…. Nik: Julia and I have constant joke is that we’ve actually never had a conversation about food. Julia: We always talk about our dogs. And plants. Julia: I’m like, “Nik, get an anchor!” ([To Nik:] You need a gay woman closer to you. We live too far apart.) But I think the family question is really interesting in how it pertains to food and how we write about it. Being able to make a choice about how to describe how you serve a recipe and who you serve it to—those are maybe not the most obvious ways, but they’re really valuable ways to shift ideas and open minds and to use food to make sometimes-uncomfortable conversations more comfortable. Nik: I want people to sit with me at the table and feel comfortable, but also be able to have a discussion that might be uncomfortable. I think it’s better to just do it an atmosphere where everyone’s relaxed, and food tends to do that to most of us. When I was writing Season I wanted it to be applicable to anyone, whether they’re gay or straight, whether they were from America or not from America—I wanted everyone to feel welcome and comfortable. That’s the reason why I decided just to share my story in the book, so people can maybe identify with the different parts. That’s the same thing that I want to do with photos. I have a tendency to show my hands. I want people to be able to imagine themselves in the kitchen. 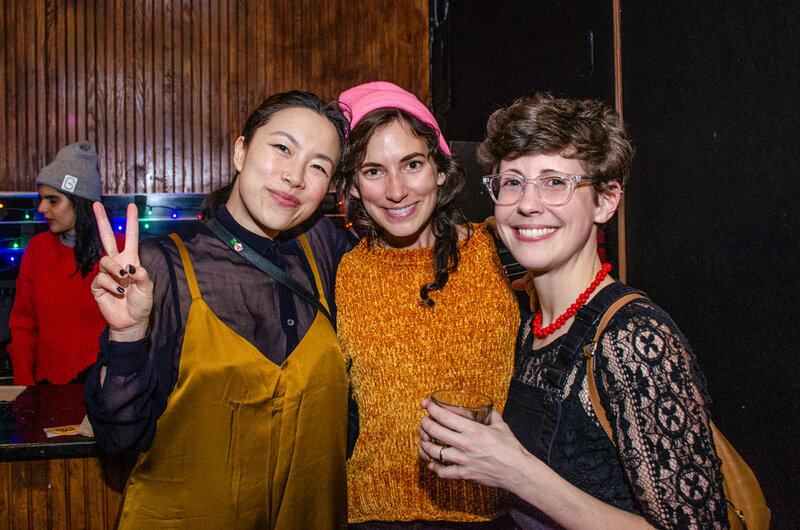 There’s a long history of community cookbooks—Junior League cookbooks, or church ones, or, say, feminist collective cookbooks. What types of books have inspired you, as far as speaking for or representing different communities? Julia: My parents worked in publishing and I was always around cookbooks—that’s how I learned to cook. I was surrounded by pretty eighties-bougie lifestyle cookbooks, in love with Lee Bailey cookbooks—he was this really funny gay man who threw lots of dinner parties that I imagined attending as a six-year-old. [laughs] It took a while for me to figure it out! He was never out or talking about it or anything like that. And I loved Ina Garten’s books and all these things, all these really familiar books. But at some point, I realized I wasn’t finding cookbooks that made me feel like I identified with them personally—I realized that books I thought I identified with didn’t represent me. And so my work became about seeking to create what I didn’t see. Nik: I had a different experience with cookbooks. I didn’t grow up wealthy, so encyclopedias and cookbooks were my window into the world. I started using those to understand and see what people were doing in different parts of the world. For me it was very exciting, I was coming from this place of curiosity. I feel like the language that writers use, the photos… Visual quality has now become a big thing. But those are the things that drew me in. I was learning and absorbing knowledge. Now the books that I’m drawn to are the ones that teach me about the culture of a country that I never experienced growing up. It’s my way of learning about the past, the history of a country, where ingredients come from, how they changed over time. And then also how food is related to race and gay culture, too. It’s just fascinating. Cookbooks are actually a text book. They act as a great source of reference. Julia: The author Laurie Colwin—who didn’t really write cookbooks, but sort of memoirs with recipes—talked a lot about how if you look at a culture’s cookbooks, that’s how you’ll really learn about day to day life. More than any history book, you really learn about people through cookbooks. That makes a lot of sense. In light of your books, books that are more than just recipes but have a voice and perspective and a larger offering—in terms of that scope, what, to you, makes a good recipe? Nik: One that works. That’s always a big number one. And it has to be something that engages someone. The books and recipes that I always remember are the ones that have a story to tell. I might not cook the recipes, I might not remember what the recipe was a couple years later, but it’s the story that I walk away with. Those, I feel, are the richest ones—the story that’s embedded inside. Nik: We want people to connect with our books at the end of the day. [Audience question:] How do you address authenticity in your work—what does it mean to you? Nik: I think the main thing is just to acknowledge the people or the culture that the thing comes from. I think Julia does this beautifully. She’s always looking to help people from different communities and give them a voice. I’m not a fan of either word, tradition or authenticity. A recipe that was handed down to me by mom, was made by her mother, who probably got it from my great-grandmother—it’s changed so much over time. That’s not the definition of what’s traditional or authentic. I also view both of those terms as chains. At this point in my life I don’t want people throwing me into a box and telling me I have to do something that’s traditional Indian. I honestly don’t know what that is. I didn’t grow up in a traditional Indian household. For me, those kinds of words actually make my skin crawl a little bit. I want to be free. I want to do what I want. Julia: To me it’s about the story, and it’s about giving credit. Saying, “How did I learn about this thing and what does it mean to me? Why do I think you might enjoy it, too? What has it done to make my world bigger?” Similar to Nik talking about growing up with cookbooks and what he learned about this country through cookbooks—I got to learn about the whole world through cookbooks and it made my world so much bigger than my suburban teenage life. To share those stories and never claim authority over anything I don’t have any authority over is important. Audience question: What role has social media played in your work, and in helping you redefine relationships and determine what community is? Julia: Grace and I share things about our personal life in a way that helps connect us with other people—I don’t know what other medium would do that that so easily, and quickly, and allow us to have such direct connection. It’s an amazing thing to put out a cookbook in the age of social media. In general, you see people share recipes and stuff, but when I wrote my first cookbook I wrote about Grace’s favorite cake, called “Happy Wife, Happy Life Cake,” because that’s how I think of it. To have people, via social media, tell me what it means to see a woman talk about her wife so regularly and so frequently in a cookbook, something people put on their coffee table and in their grandmother’s room and that their father in law will read... The social media component of getting to have that connection in addition to the book is really amazing and so valuable. Nik: With this book, I really wanted to be—not a role model, because I feel like that creates this image of perfection and I’m not perfect—but I always think about when I was a kid questioning my sexuality, questioning who I was, and there was no one to look up to or look at and say, “Okay, they were fine at the end of the day when they came out.” I’ve been really honest about my life and sharing it publicly, and that is my hope, to be that person to someone. The internet has been something of a free market for that kind of stuff. I also think it’s amazing that Julia and I are living in a time where two queer authors are with the same publisher, and have all this support from a mainstream publisher. It’s just fantastic that we live in this time when we’re both open and we know that there will be authors after us who will never have to think about being gay as an issue. For more information about Julia, Nik, and their work, visit their websites: Juila Turshen and A Brown Table. Last weekend at Valley Variety in Hudson, NY, we sat down with writer and journalist Brian Schaefer and photographer Kristopher Kelly, who created our Issue 4 story “Rum and Revolution: Seeing Cuba through Its Cocktails.” It was a broad-ranging conversation about their visit, touching on history, rum, and what it’s like to travel with a group of 16 gay men. Below are some highlights from our conversation. Steve Viksjo, Jarry Creative Director: I’ve heard a lot of people tonight say, “I want to go to Cuba,” but there are special circumstances about being allowed to visit. Can you tell us how you put the trip together? Kristopher Kelly: I knew that I wanted to do something focused around LGBT travel, and so I did some research and found a company called OUT Adventures. They’re an approved travel provider with the US Treasury Department to provide travel to Cuba. I’m not an expert in any of this, but as the laws were changing and things were becoming more open, more people were able to travel to Cuba. But there were still a whole host of restrictions. There are only twelve travel categories that are allowed, and one of those is “people-to-people.” That’s how OUT Adventures classifies their trips. So, through them, Brian, me, and several mutual friends were able to go legally. While we were there, we met with LGBT Cuban activists, visited local theaters, and did a variety of other things that were directly related to cultural exchange. Lukas Volger, Jarry Editorial Director: What were your expectations for the trip, and for Cuba? Brian Schaefer: I think one of the ongoing characterizations, and a bit of a cliche, is to define Cuba as being stuck in the fifties. We get that impression because of the photographs we see of the classic mid-century vehicles driving around, and they are there and certainly kind of dominate Havana, but they’re mostly taxis and they’re not cheap. But you do get that aesthetic. More accurately—and this is a point that my partner Stephen liked to make and I think it’s true—it feels like a country that’s paused in the nineties. Technologically speaking, you are basically offline unless you stand in line to wait for a government issued internet card. That gives you an hour to then go to a public hotspot to sign on to then have spotty service. The parks and public spaces are where Cubans go to check Facebook. It’s not censored, they have access to social media and websites, but the ability to sign on is something that is lagging behind. SV: When we developed the piece for Jarry, you were tasked with bringing food and drink into a story about traveling to Cuba. Brian very elegantly combined the country’s complicated history and its cocktails. Can you tell us a little bit about how that idea came to be? BS: Going into the trip, I wanted to send the guys a reading list to prepare us for the experience. I didn’t want us to go in blind, without any sense of history, but I also didn’t want to assign history and textbooks. So the list that I curated included literature and memoir, and then also a little bit of history. And after doing some research, the history that seemed the most fun to engage with was Bacardi and the Long Fight of Cuba by Tom Gjelten. It tells the story of the history of Bacardi in Cuba—Gjelten looks at the arc of the past 150 years of Cuban history through the story of the Bacardi family. 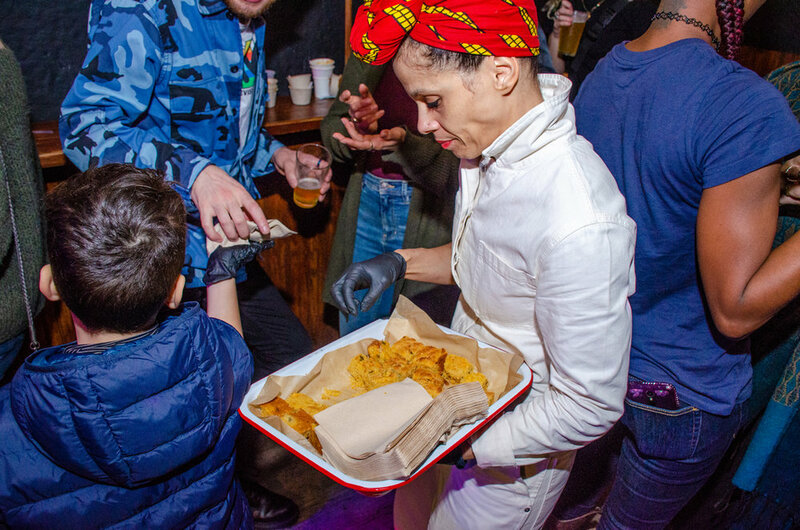 It felt like a really interesting way to take a product that we associate with parties in clubs and having a good time, but actually allows us to get much deeper into the history and politics of this place. That book inspired the lens through which we approached this article. That was the first book. The second one was Before Night Falls, the memoir by Reinaldo Arenas, a gay Cuban poet and writer who, with the LGBT community, was put into forced labor camps and treated horribly during the Castro regime. That felt important to us, going in wth kind of pure lens to understand what that community faced, and to also see that side of the regime. And then, to include a bit of literature, we had Our Man in Havana by Graham Greene. Even though it’s a fun spy read, it does give a taste of the foreign influence in Cuba. It offers a perspective in terms of how America has really directed the way that Cuban has grown—our interference and influence helped shape a lot the choices that the country has made, and something that we Americans have to reckon with. The last was Ernest Hemingway’s The Old Man and the Sea. He has a huge presence in Cuba. He lived in an old farm—really, an estate—for twenty years, built really strong relationships, and also wrote very eloquently about its cocktails. LV: We’re having a rum tasting tonight [thanks to our sponsor Fairview Wine & Spirits! ]—there’s a Bacardi 8-year rum, as well as two Havana Club rums, the gold and silver, and you noticed that the Havana Club rums actually comes from Puerto Rico. BS: There's an ongoing legal dispute over the trademark on Havana Club rum. Havana Club was a rival of Bacardi but in the aftermath of the revolution, Bacardi claims to have purchased the copyright from the family that started Havana Club, even as the Castro regime nationalized that brand. The government-owned version of Havana Club struck a distribution deal with international conglomerate Pernod Ricard, which sells it everywhere in the world except the United States (because of the embargo). Meanwhile, Bacardi sells its version of Havana Club in the United States as a product of Puerto Rico, where the company is now based. The legal fight continues. Audience Question: You mentioned the Bacardi family was momentarily progressive, maybe, at the time of the revolution and open to some negotiation with the revolutionary government, and I’m curious to know—were the Bacardi’s slave owners, and to what extent were they plantation exploiters? BS: That’s a great question. Cuba did have slaves, and enslaved Africans were the ones who were doing the sugar harvesting as it was a growing industry in Cuba. Slavery was abolished in 1886, so it slightly predates the Bacardi family. Which is not to say that there wasn’t still exploitation that continued afterwards, but it wasn’t based on the slave trade, that their business or the rum industry developed. That’s the best I can do right now, but I can certainly refer you to the book. Audience Question: Have you had any contact with friends that you made while you were there? Do you have any kind of accurate report on how the island is doing now after the hurricane? KK: Yes, I reached out to Out Adventures to see about our guide that was with us, and know that he’s okay. They haven’t been able to get in contact with anyone that runs one of the houses where we stayed in Havana, and so the fear, based on where it was located, is that likely it was flooded. We met a number of Cubans and do follow them on social media. While we haven’t been in direct contact with them, they have been posting recently, as if nothing is wrong. Clearly though, the hurricane impacted Cuba significantly as well as the Caribbean. SV: Kris has done some research regarding relief efforts in Cuba and he has learned that it is often difficult to reach LGBT people in these regions because oftentimes the relief efforts are led by religious organizations. They aren’t necessarily discriminating against anyone, but if you’re queer you may not feel comfortable approaching them, or for whatever reason you are harder to reach. Consider Donating to the Caribbean Vulnerable Communities (CVC) Coalition, which specifically serves LGBTI persons affected by Hurricanes Irma and Maria. SV: Kris, what was your experience like shooting this piece? KK: As you mentioned in the beginning, we didn’t really know how the story was going to take shape. I knew it’d be about cocktails, and clearly as we were going through Cuba, I was thinking, how can I photograph the food and drink as we were drinking? Also, there are parts of Cuba that are clearly impoverished, and there were times when I didn't feel comfortable shooting these people or places. Other times, I decided that I wanted to experience a moment for myself without lifting up my camera. LV: I’m curious about the experience of traveling with Out Adventures. Being part of an LGBT travel group must have meant that you were very out. 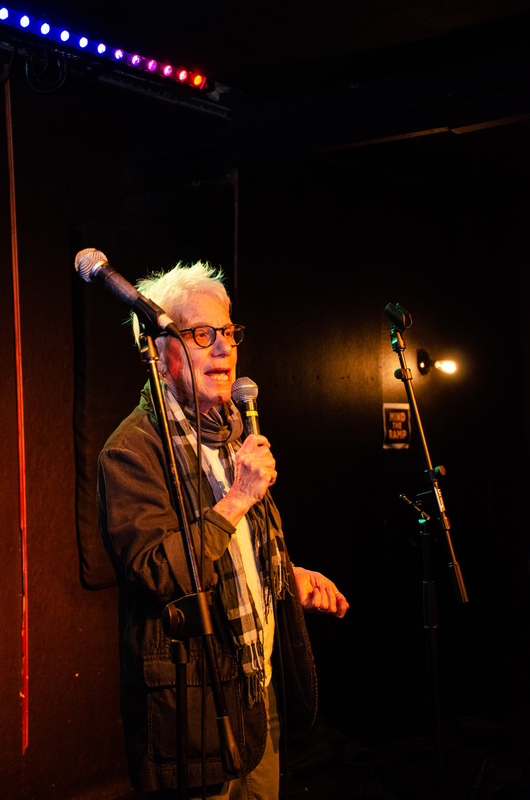 KK: We were a group of 16 gay men walking down the street—so there was no way that we couldn’t be “out.” I personally, never felt, ever not safe. There were a few times that we were told not to travel to certain areas. BS: As part of our trip, we did meet with Cuban gay activists, they seek more rights, but they don’t want to identify as a “community.” they seem themselves as Cuban first - one community - and don’t want to separate themselves. SV: Did those activists describe for you their experience of being gay in Cuba? BS: The activists spoke a lot about the political progression of gay rights, frequently mentioned Mariela Castro, the daughter of Raul and niece of Fidel. Since 2000, she has run the National Center for Sexual Education and expanded its focus beyond mostly women’s health to include LGBT people, and I think for 10 years now they have had anti homophobia, anti transphobia marches, and her research has led to some legislative progress, too. But, a social stigma is oftentimes still there - being a largely Catholic nation. Like everything else in Cuba, the status of LGBT citizens is complicated. I think the trip brought up more questions than it answered. In the aftermath of Hurricanes Irma and Maria, there's much need for help throughout affected regions in the Caribbean, including Cuba. LGBTI people often face challenges not addressed by traditional, often faith-based relief efforts. 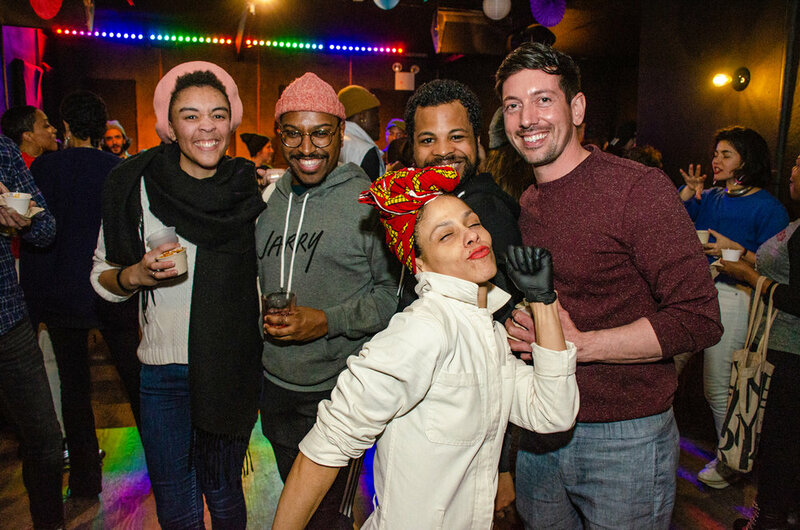 The Rustin Fund and Alturi are raising money for the local and grassroots organization Caribbean Vulnerable Communities (CVC) Coalition, which specifically serves LGBTI persons. We encourage you to give what you can. Read "Rum and Revolution: Seeing Cuba through Its Cocktails," by Brian Schaefer, with photos by Kristopher Kelly. Shortly after landing in Havana this spring, my partner and I and two close friends dropped off our bags at a renovated colonial-style casa particular, a modest bed-and-breakfast, and walked a few blocks to the famed Hotel Nacional de Cuba for some of that relaxation. A brisk wind from Havana Bay whipped through the courtyard, where musicians, movie stars, and mobsters mingled after its 1930 opening, among them Frank Sinatra, Rita Hayworth, Meyer Lansky, and Lucky Luciano. A decade into the Prohibition Era, Havana had become the go-to watering hole for fun-loving Americans, which proved a boon to Cuba’s rum industry. Our daiquiris arrived in martini glasses. They were light, tart, and translucent, nothing like the syrupy red slushy that I downed as an 18-year-old on a family vacation in the Bahamas, the first alcoholic drink I ever bought for myself. Looking back, I think of that drink as candied training wheels for a life in liquor: College brought bitter kegs and cheap tequila, after which came microbrews and vodka-sodas, followed by wine and whiskey of increasing quality. I’d always associated rum with inexperience, frivolity, and tiki lounges. Cuba changed that. The daiquiris at the Nacional were the first I had had in a dozen years, and the first of many over the next nine days. But we had not come to drink our way through Cuba. 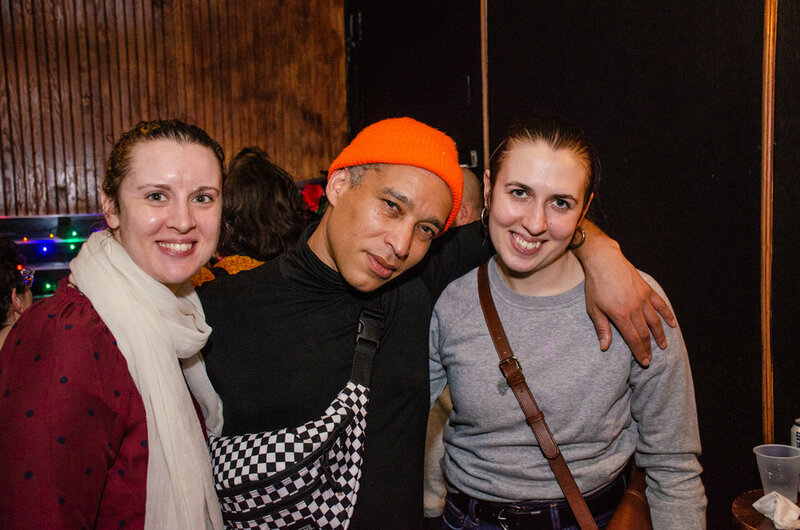 We were on a people-to-people tour spanning four cities and hundreds of miles, culminating in meetings with artists and LGBT activists in Havana. We were a multi-generational group of gay Americans from New York and Newark, Portland and Pittsburgh, confused and curious about our closest Communist neighbor. And we drank a lot. Daiquiris of various shades and strengths; mojitos with glittering mounds of sugar crystals sprouting forests of mint; Mary Pickfords, Cubatas, Mulatas, and other indigenous libations. There was beer, too—Cristal and Bucanero are the local options—but rum is the country’s proudest and most prominent renewable resource. By the end of the trip, one member was pouring shots into his morning coffee. I know this sounds decadent and superficial, an Atlantis cruise on land. But to indulge in rum in Cuba is not to reduce that complicated place to a sweet intoxicant. Rather, it is to partake in one of the country’s cherished traditions, its tumultuous history—from colonial times to independence to revolution and modern reforms—and its unique spirit. Christopher Columbus brought sugarcane to Cuba on his second voyage across the Atlantic, in 1493, introducing what would become one of the country’s staple crops and a piston in the engine of its economy. Extracting sugar from the plant created leftover juices and molasses, which 16th-century Spanish settlers distilled into tafia, a low-grade cousin of rum. Technological innovations in the 19th century yielded increased sugar crops and better distillation techniques, which an immigrant from Catalan named Don Facundo Bacardi perfected, eventually establishing a rum company in his family’s name in 1862 in the southern city of Santiago de Cuba. Until that point, rum had been heavy and harsh, more an aguardiente than a sippable tipple. Bacardi’s innovation was to use the charcoal filtering favored by vodka distillers, plus years of careful trial and error, to get the formula just right. The result was a smooth, clear spirit—a premium white rum. Bacardi also had an eye for advertising, adopting the memorable image of a bat for its logo. According to journalist Tom Gjelton, in his book Bacardi and the Long Fight for Cuba, early Bacardi batches were sold in recycled olive oil containers featuring that creature. The mascot stuck, still found on any bottle of Bacardi rum at your corner liquor store, as well as stamped in brass on the doorknobs of the Bacardi Building in Old Havana, an Art Deco masterpiece from 1930. In 1868, not long after Bacardi’s founding, Cuba rose up against Spain, its colonial occupier for the previous 400 years. The Ten Years’ War, as it was called, ended in Cuban defeat, as did a subsequent effort, known as The Little War. The third part of the trilogy, the Cuban War of Independence, spanned 1895–98 and finally earned Cuba its autonomy. We know that conflict as The Spanish–American War, which sent future president Teddy Roosevelt to Cuba as a Rough Rider and rewarded the United States with significant political and economic influence over the island, giving Cuban independence a big stars-and-stripes asterisk. When they lifted their glasses to toast, someone proclaimed ¡Por Cuba Libre! in honor of their host country’s new freedom. A modern cocktail was born. Americans were also responsible for a now-ubiquitous Cuban beverage. In 1900, in the aftermath of victory, off-duty soldiers from the U.S. Signal Corps were schmoozing in a Havana bar. One of them boldly ordered a Bacardi rum and a new import called Coca-Cola, with a wedge of lime. The successful combo was then ordered by the whole gang. When they lifted their glasses to toast, someone proclaimed ¡Por Cuba Libre! in honor of their host country’s new freedom. A modern cocktail was born. The most memorable Cuba Libre I had was in a small restaurant off the Prado, or main boulevard, in Cienfuegos, a port city that bears the elegant architectural markings of the French merchants who settled there in the early 19th century. When it was placed in front of me, I mistook it for iced tea. It had a sharp tang and I saw that it was composed of equal parts lemon juice and cola, giving it an unexpected but not unpleasant bitter-sweetness. It’s a taste I now associate with that town, a charming place exhibiting all the competing narratives of contemporary Cuba, which look something like this: A gorgeously renovated colonial hotel, near a local provision store which may or may not carry eggs that week, near a bank with a line stretching down the street, near a perfectly manicured European-style square with a grand bandstand, which is surrounded by old movie theaters and fancy residences, beyond which lie neighborhoods in utter decay. It’s a mosaic repeated in every city we visited, and somehow it all mixes, bittersweetly. Other stops on our itinerary are now linked in memory to specific drinks, like the canchánchara, the official beverage of Trinidad, a colonial town founded in 1512 with cobblestone streets and bright pastel walls. Trinidad lies near Valle de Los Ingenios, one of Cuba’s largest sugar-producing regions where enslaved Africans harvested stalks of white gold (slavery was abolished in Cuba in 1886). Canchánchara appeared during the Ten Years’ War; it features the same ingredients as a daiquiri—rum, lime juice, sugar—but with honey mixed in, giving it a richer texture and sweeter sting. At night in the town square, serenaded by live music, you can order one in a little plastic cup from window counters that look like bank tellers for about $3 each. Meanwhile, in Viñales, a small, bustling tourist town on the edge of a national park that was scouted as a possible setting for Jurassic Park, the standout cocktail was the Anti-Stress, found only at Casa de Confianza, a beautiful hillside organic farm and restaurant. Adapted from an old family recipe, the Anti-Stress takes a piña colada base—pineapple, coconut, rum—and adds a five-herb blend of anise, lemongrass, basil, peppermint, and Yerba Buena, a plant also in the mint family (all grown onsite). The result is a celadon-colored concoction with a hint of mellow earthiness; among our group, it was the most popular cocktail in Cuba. Hemingway took his with double rum, hold the sugar. Today, after fighting swarms of tourists, you too can order a Papa Doble, a nod to Hemingway’s nickname, at the Floridita. Across town, down an alley from a vast cathedral sits a dive called La Bodeguita del Medio, where Hemingway was also a regular, along with other notables like Errol Flynn, Pablo Neruda, and one Ché Guevara. The American writer alternated between the two joints for variety. A handwritten note, supposedly by Hemingway, hangs in La Bodeguita: “My mojito in La Bodeguita, My daiquiri in El Floridita.” The literary associations of these cocktails situates them conveniently in the first half of the 20th century, a period of relatively amiable relations between us and them, before Fidel Castro took over in 1959, before the 1961 Bay of Pigs invasion, before the 1962 missile crisis. Of course, such romanticizing makes history hazy, as if studied after a round of Papa Dobles. To visit Cuba as an American today is to face, clear-headed, our own culpability in stunting the young country’s progress by aggressively pursuing our own economic interests. To visit Cuba as an American today is to face, clear-headed, our own culpability in stunting the young country’s progress by aggressively pursuing our own economic interests, by supporting corrupt politicians, like the dictator Fulgencio Batista, who Castro ousted in his revolution, by subsequently driving the small island into the Communist arms of Russia, by stubbornly keeping our feud alive decades after moving on from much heavier and more costly conflicts, like Vietnam. Sinatra and Hemingway’s daiquiris and mojitos were likely made with Bacardi rum, then the national brand. Today, you can’t find reference to Bacardi anywhere on the island, aside from its former headquarters in Havana. Bacardi, a multi-generational family-owned progressive and patriotic business, was initially cautiously supportive of Castro’s movement until he nationalized the company in 1960. Clever business maneuverings allowed them to reinvent themselves abroad, setting up shop in Puerto Rico and becoming an international liquor conglomerate. In the decades since the revolution, family members in Miami have funded anti-Castro efforts, lobbied Congress to recognize its rights over confiscated property, and spent millions in court fighting the Cuban government. Meanwhile Havana Club is the new national brand, and the ongoing battle between the rum giants illustrates the country’s continuing internal conflicts. When the Castro era ends, which it will in 2018 when Raúl Castro steps down as leader, a new chapter will begin. We don’t know the direction, but we know what Cubans will be drinking. Rum flows directly through Cuba’s messy modern history, reflecting the country’s appeal and its perils. It is neither as carefree as the vintage 1957 Chevrolets that prowl Havana’s seaside promenade suggest, nor as draconian and desperate as the impression given by American high school text books. 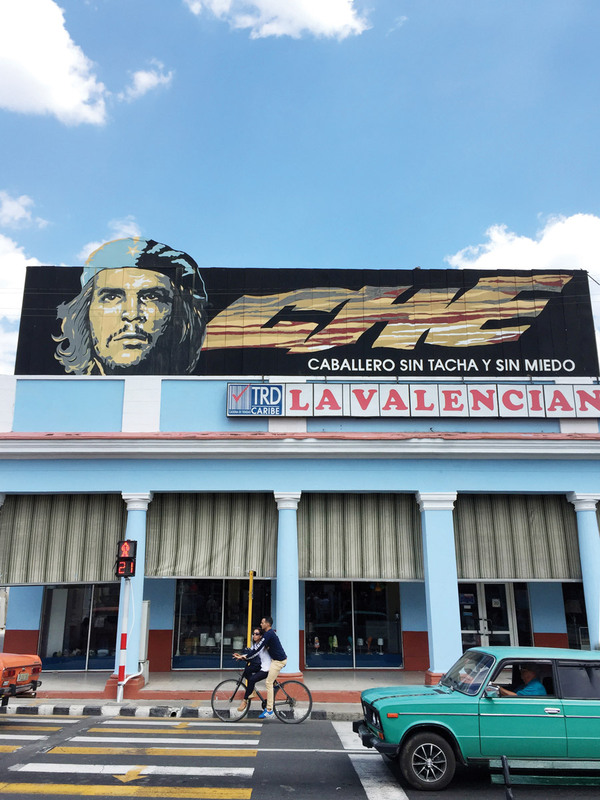 Billboards salute Ché and rail against the embargo, while Cubans wear tank tops in the pattern of American flags and enthusiastically welcome their “frenemies” to the north, as one called us. Cuba proudly wears its contradictions on its guayabera sleeves. We'll be talking with "Rum and Revolution" writer Brian Schaefer and photographer Kristopher Kelly, serving Canchánchara's, and tasting three varieties of rum this Saturday, September 16th, at Valley Variety in Hudson, NY. This Cuban cocktail, featured in Brian Shaefer's Issue 4 story "Rum & Revolution: Seeing Cuba through Its Cocktails," appeared during the Ten Years' War, part of Cuba's fight for independence from Spain. It features the same ingredients as a daiquiri—rum, lime juice, sugar—but with honey mixed in, giving it a richer texture and sweeter sting. 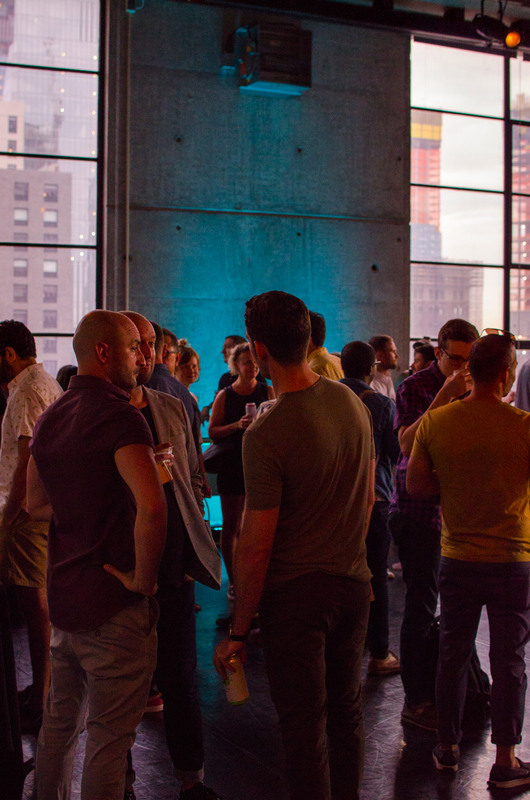 Thank you to all who attended our Sunset Soirée to celebrate Issue 4: Journeys! Blackcreek Mercantile & Trading Co.
Be sure to subscribe to the Jarry Briefs newsletter to receive event updates and invitations direct to your inbox. In a tom collins glass or tumbler, stir together the gin, kirsch, and cherry syrup. Add ice to fill, then top with the Spiked Seltzer. Garnish with cherry and lime wedge. Cherry syrup: Combine 8 ounces fresh or frozen pitted cherries with 1/2 cup sugar and 1/2 cup water in a saucepan. Bring to a simmer, stirring periodically to prevent scorching, and cook for 15 to 20 min, until reduced slightly. Pour through a cheesecloth-lined sieve to strain out the solids, pressing or squeezing to extract as much syrup as possible. Cool and store in a bottle or other airtight container. Place ice cream in a goblet or tumbler. Top with the spiked seltzer. Serve with a straw! Spiked Seltzer is the exclusive liquor sponsor of the Sunset Soirée celebrating issue 4. 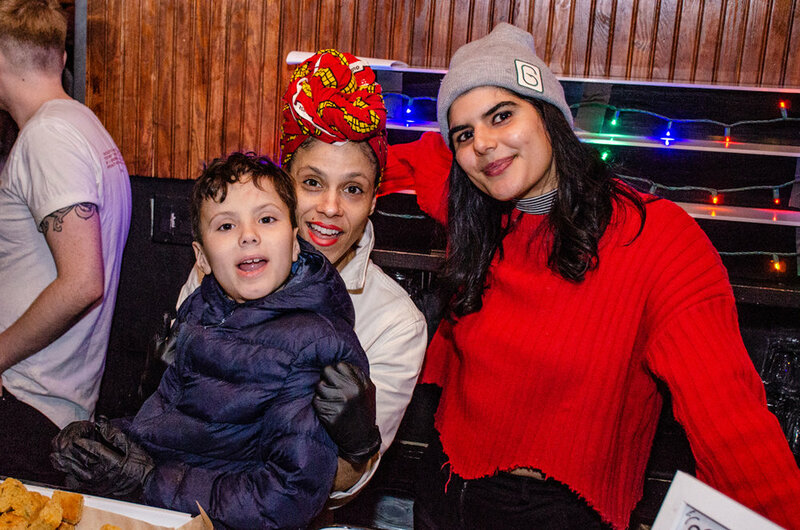 On December 10, 2015, Jarry was thrilled to present Savor the Season, a benefit dinner put on in partnership with and for GMHC. 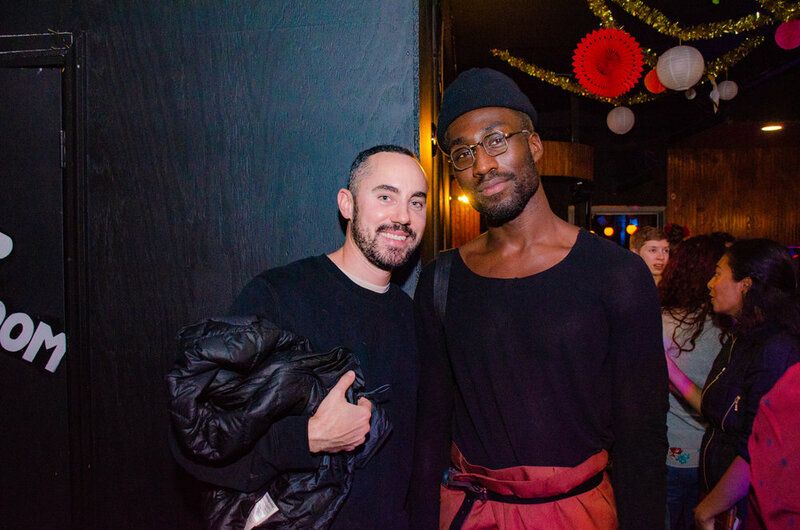 Hosted by the celebrated writer, bon vivant, and fashion commentator Simon Doonan, the centerpiece of the evening was the fresh, seasonal fare of chef and author Steven Satterfield. Satterfield is traveled up to New York from his hometown of Atlanta. We sat down with him before the dinner to discuss his projects and inspirations, and what to anticipate at Savor the Season. In your book Root to Leaf, you write about how cooking locally and seasonally is inspiring rather than constraining. Where does the misperception about that come from? How do home cooks begin to adopt your approach? The beauty of working with fresh produce is that there are less hard rules about cooking them which allows for more creativity and leeway. Often one vegetable could be experienced raw, blanched, sautéed, roasted, fried or pickled and all yield delicious results. Additionally, because most of the recipes in Root to Leaf are easy to execute and simple, seeing the outcome creates an "a-ha" moment for the reader, initiating "I never knew radishes could taste so good" or "who knew Brussels sprouts could be so easy to prepare" kind of moments. If you were to cook locally and seasonally in another city or geographical region, where would that be? I've had the great fortune to cook in Sonoma for the past three summers and I love that area. The produce is insane and there are so many micro-climates that it's like having 3 seasons in one! I also love to cook with other chefs that understand their regional resources and utilize them in everyday cooking. It's always a learning experience to share ideas and compare the foods of our regions. Similar to our Issue 1 cover guy Blake Bashoff, who was an actor before switching to a career in food, you used to be in the band Seely before becoming a chef. Does food satisfy a similar creative itch that music does? Not only did I play music but I also studied architecture. Both of these experiences were big influences on who I am today. They both require creative process, lots of time and energy and working with your hands as a craft. The same definitely applies to cooking. Having worked for Scott Peacock, the acclaimed American chef who's gay (and at that point at Watershed, owned by Emily Saliers of Indigo Girls! ), you're no stranger to LGBTQ people in the kitchen. Do you find that being gay informs your approach to food at all? Have you seen any changes during your career, with regard to more chefs and kitchen staff being out? 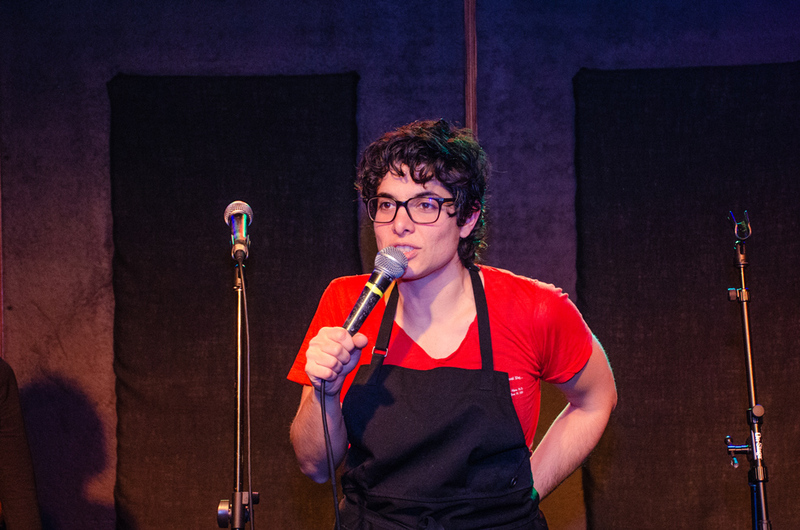 It's not uncommon to work alongside lesbian women in professional kitchens. They have been trailblazers for decades. It is less common to come across gay men. Much like the military ranks, kitchens have mostly been dominated by straight dudes, but as our society evolves, I see more diversity in the back of the house of restaurants. There is also so much less discrimination than in the past. I think the advantage of being gay and cooking is that you can be in touch with both the masculine and feminine sides of food and having that ability to toggle can make you a more well rounded cook. What's inspiring you at Miller Union right now? What can guests at Savor the Season look forward to? I love cooking in the fall! Be prepared for a lot of fresh produce on the table highlighting the best that the season has to offer.